Read Tim's predictions for talent acquisition in 2018. Tim defines eight components of a great recruiter. Tim's #Nextchat answers questions about recruiting great talent. Corporate talent acquisition has been failing for decades, but it doesn’t have to. There are simple fixes, organizational designs, and technology that can turn around the success of an organization’s ability to recruit almost overnight. Piece by piece and step by step, with real-world examples and stories about how innovative organizations and top talent acquisition leaders are successfully recruiting today, The Talent Fix presents a proven, practical, and scalable recruiting model for talent acquisition leaders and practitioners and shows how organizations can build and sustain a great talent acquisition function. 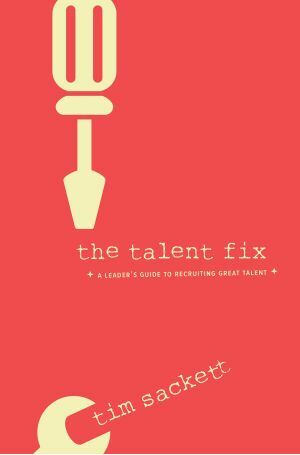 “If Recruiting is the 'Tip of the HR spear', The Talent Fix is the best primer on how to wield it. It's time for Talent Acquisition leaders everywhere to step up and lead.” – Gerry Crispin, co-founder of CareerXroads and TalentBoard. “The Talent Fix is for every leader who's been told to fix a broken hiring process but needs a specific place to start. Tim is the one person in the HR industry who will give you a detailed recruiting roadmap that tells you what you should do, how to do it, and why.” – Laurie Ruettimann, SPHR, founder and CEO of LFR Inc.
“Tim makes Talent Acquisition come alive! For anyone who wants to successfully identify, recruit, hire, and retain talent, this The Talent Fix is full-blown toolkit from someone who’s lived the work and has thrived.” – Steve Browne, SHRM-SCP, executive director of HR for LaRosa’s, Inc. and author of HR on Purpose !! Tim Sackett, SHRM, SCP, SPHR is president of HRU Technical Resources a leading IT and Engineering Staffing firm headquartered in Lansing, MI. Tim has 20 years of combined Executive HR and Talent Acquisition experience, working for Fortune 500 companies in healthcare, retail, dining and technology. Tim is a highly sought after national speaker on leadership, talent acquisition and HR execution. He also is a prolific writer in the HR and Talent space, writing for Fistful of Talent and his popular HR blog The Tim Sackett Project. He has written more than 2,000 blog posts, articles, webinars, and white papers on the topic of HR and Talent Acquisition execution and has developed a passionate audience around the world.